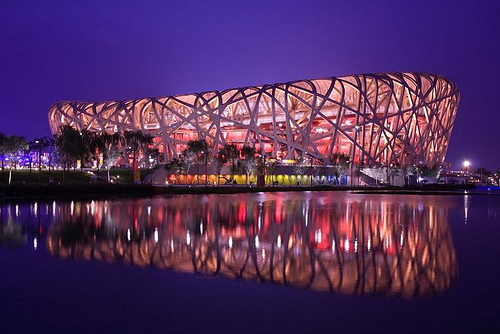 Just a few days ago the 2008 Summer Olympic Games in Beijing drew to an end. The 29th edition of the summer Olympics was highly anticipated and debated due to the complex political climate; many times, the real protagonist of the games – the sports and its athletes – risked being left in the background. Regardless of the political environment, we think it correct to honor the athletes that participated putting months and months of hard training to the test, often for just a few minutes of competition. The two unquestioned winners of these Olympics are the American Michael Phelps with 8 gold medals and the Jamaican Usain Bolt who estabilished a new world record for the 100 metres in 9″69. Italy also enjoyed great satisfaction at these Olympics, with almost three hundred athletes participating. Tuscany in Beijing 2008 was represented by 28 athletes in many different sports, from fencing and swimming, to sailing and athletics. Giulia Quintavalle, a young athlete born in Livono and living in Rosignano Solvay, gained the gold medal in the under 57 kg weight class in Judo and Luca Agamennoni from Livorno partecipated in the conquest of the silver medal in the men’s quadruple sculls in rowing. The windsurfer Alessandra Sensini from Grosseto won the silver medal in the RS:X class honouring her loved Maremma that sponsored the athlete for these Olympic Games with the brand “Maremma Tuscany” (it’s the first time a geographic territory sponsors an athlete). Aldo Montano from Livorno and Salvatore Sanzo from Pisa won two bronze medals, in the men’s team saber competition and the men’s individual foil, respectively. The winners can now enjoy a well-deserved period of rest, while those that did not reach their goals are already looking forward to start training for the next Olympics. The rendezvous for everyone is in London 2012!